Water Treatment Systems for Home Owners Using Well Water, Communities, Businesses, and Aquaculture. When you call, an onsite test will be scheduled to determine the causes of your water quality issues. Within 48 hours of your onsite test you will receive a fixed-fee quote for a custom-designed water treatment system. It will include all equipment, materials, labor, travel, and, if needed, a follow-up to tweak your system. Systems may include water softeners, water filters, and water treatment - depending on the particular water quality issues. With the purchase a complete water treatment system your satisfaction is guaranteed! If you use well water at home, have poor quality water, and you live in the service area listed on our free water analysis page, your well water quality issues can be solved. 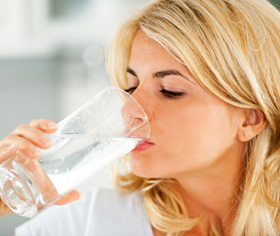 Learn about home well water treatment systems. If your community water system does not meet Washington Department of Health requirements it is important to install a system which addresses your water quality issues. Your new, easy-to-maintain system can be installed in your pump house. Learn about community well water treatment systems. Protect your equipment and ensure up-time with quality water. Specializing in water softening, media filtration, and reverse osmosis systems. Learn about commercial water treatment systems. If you want peace-of-mind with your new seawater filtration system you're in the right place. Every design is tested before being installed to ensure it addresses your unique seawater quality issues. Our track record of success ranges from city water chlorine reduction to brackish water (salt water) wells with reverse osmosis to large iron and manganese filtration to large aquaculture filtration systems. Learn about aquaculture seawater filtration systems. Contact us today to learn more about a water treatment system for your home, community, business, or aquaculture company.